The perfect dialogue recording space for TV drama and film work. 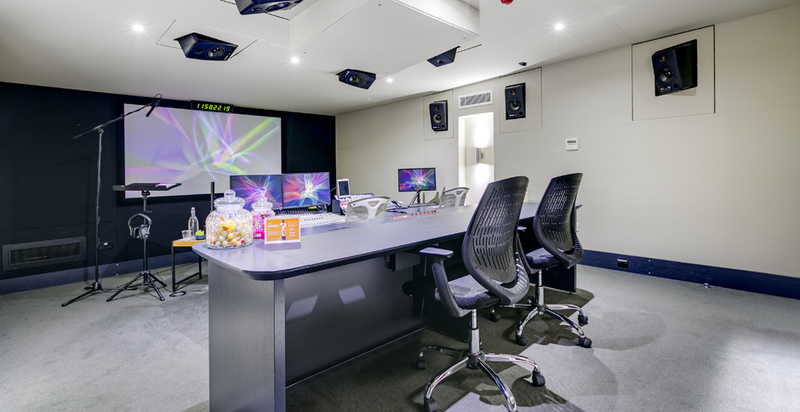 Our two main ADR studios come with ISDN, Source Connect, Skype and remote picture sync facility as standard. Our team understands that the ADR (Automated Dialogue Replacement) process can be a complicated and occasionally alien experience for some actors. So our engineers, audio producers and studios work together seamlessly to create the perfect environment in which the talent can relax, and simply focus on recreating that crucial character performance. Our newly created large reception space is also ideal for high-profile actors and clients to relax when not recording. Studio 7 is a sizable 'open-room' suite. It's also Dolby certified and was designed by some of the best acousticians in the industry. With space for up to 8 or 9 clients and 3 or 4 main actors, the studio also has mic points and headphone ports everywhere making it a great space for crowd recording too. It features a two meter projected image and several smaller screens around the room ideal for checking sync. Our EdiPrompt cueing system allows for all manner of wipes, pips, streamers and counters, whatever suites the actor. In conjunction with EdiCue it's also perfect for ingesting large EDLs (Edit Decision Lists). We would recommend a test-connect prior to any remote session, to avoid any potential connection issues. Please speak to a member of the bookings team about scheduling a free-of-charge test-connect.